In the two-plus years I’ve been recording my chase to collect every single issue of Amazing Spider-Man, I’ve talked so much about my desire to own ASM #1 that I don’t know if I’ve ever actually talked about the actual contents of the comic. And that’s a tragic oversight on my part. 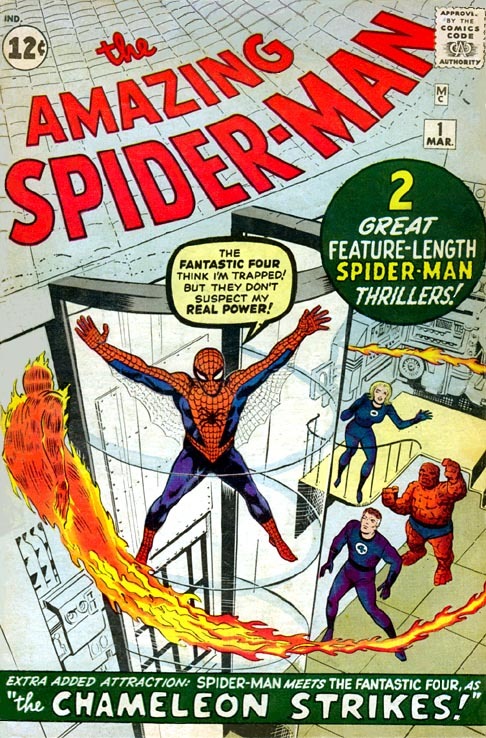 It may not be the official “first appearance” of Peter Parker and Spider-Man (that’s of course, Amazing Fantasy #15) but ASM #1 is historic in its own right – establishing the majority of the themes (and supporting cast) that would go on to define the series for more than 700 issues (as time goes on, I’m convinced that once “Marvel Now” is a thing of the past, Spidey will resume numbering so it can eventually reach that #800 milestone). Since ASM #1 celebrated the 50th anniversary of its release earlier this week, no better time than now to take a look at why this comic is not just quite expensive, but quite important and entertaining. What’s immediately so striking about ASM #1 is how it establishes the unique set of conflicts that would differentiate Spider-Man/Peter Parker from every other superhero out there. After a quick recap of Amazing Fantasy’s origin story, the plot doesn’t go on to focus on some superpowered villain running amok in the streets in Manhattan. Instead, readers see that what really stresses out our hero is the fact that with his Uncle Ben dead, his Aunt May doesn’t make enough money to support their already modest existence. Peter is ready to quit school to get a second job before May dismisses that idea. From there, Peter tries to figure out how he can put his new-found powers to good financial use. I’ve read this issue hundreds of times, and I still can’t get over how much of ASM’s debut is dedicated towards Peter trying to make a couple of bucks. We even get a very funny scene where Spider-Man performs for an audience, but he can’t get paid because the bookie wants to write him a check and Peter doesn’t want to reveal his secret identity. What a strange, weird thing to emphasize in a superhero comic – and yet its utter brilliance is not lost on me. What many people often say about Spider-Man/Peter Parker is that the character became so popular because there were no other superheroes that had these average-person problems. And I absolutely agree with that idea. But I think there’s another layer to Peter’s relate-ability that makes him such a pop culture landmark. 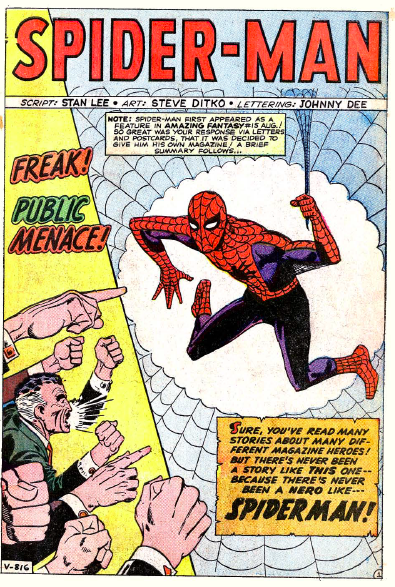 Stan Lee and Steve Ditko do a marvelous job tap-dancing on the line between establishing Peter as a sympathetic hero, or some whiny punk kid. Peter undoubtedly has a chip on his shoulder – especially when he’s around peers like Flash Thompson who deems to be his inferiors. And yet there is still something so likeable about him. He’s not trying to make money off his powers because he wants to get rich. He’s doing it because he’s desperate to support his surrogate mother who he feels he’s wronged because he was indirectly responsible for the death of her husband. Compare the depth of Peter’s character to somebody like the disaster that is Alpha (more on him and his new mini-series in the near future), and the chasm between the two goes beyond apples and oranges. Alpha’s sneers and self-confidence come across as arrogant and entitled. Peter is just misunderstood and unfortunate. What an incredible gamble by Lee, Ditko and Marvel to forge this path with arguably the greatest hero they ever created. Today, the world of comic books is filled with anti-heroes and “tweeners” who fight on the side of good one day, and are plotting to blow up the world the next. But with Spider-Man, we have a character that readers know is inherently good, and still Lee and Ditko insist that everyone else absorbed in this world – even the hero’s family members – is convinced that the character was not on the up and up. Really, ASM #1’s only true weakness both historically and from a marketing standpoint, is the total lack of a worthwhile supervillain. While the pages of ASM would go on to debut some of Marvel’s most famous bad guys, Spidey is faced with apprehending the master of disguise Chameleon in his very first solo issue. 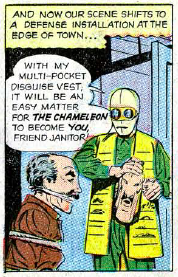 While current ASM scribe Dan Slott has made some effort to give Chameleon a little bit of clout again, the character is a total C-lister and is a terrible villainous foil for a debut issue. Doc Ock or a more animalistic character like the Vulture or the Scorpion would have been a far better choice. Fortunately, most of the very great villains would be introduced within the first 20 issues of ASM. Lastly, Marvel was incredibly smart in tying-in its other brand new comic book creation, the Fantastic Four, in Spidey’s first issue. Beyond the humor of watching Spider-Man “try out” for the Fantastic Four and then ask Reed Richards how much the job pays, the plot also establishes the geographic parameters of the Marvel universe. While Superman resided in Metropolis and Batman in Gotham City, Spider-Man, Fantastic Four, Tony Stark and others all lived in New York City. The Marvel Universe didn’t consist of characters operating within their own, entirely separate spheres of existence. That helped show that not only were the combinations of characters in the Marvel Universe limitless, but they were also a tight-knit group that would notice if some new guy in red and blue tights started swinging around Manhattan calling himself Spider-Man. So, happy 50th birthday Amazing Spider-Man #1. It still may take some time before I finally get my hands on you, but thanks to the power of digital archives, I can skim through your pages any time I choose (unless you’re reading it on comixology – whoops) and remind myself why this character and this series has went on to define my life for more than 25 years. One of the greatest stories of all time. Plus the begining of the old “Parker” luck. Everyone needs to earn a buck so this story is timeless.